As a prosperous port city in the Deep South, New Orleans enjoyed a trading boom at one point, collecting the world’s treasures brought in or manufactured by tradesmen, French and Spanish explorers, merchants, planters, and even pirates. 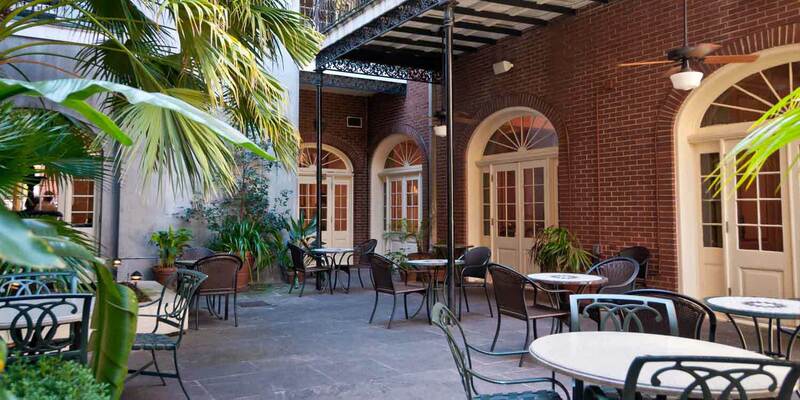 A haven for collectors and window shoppers alike, New Orleans is chock full of antique stores, many of which are clustered on Royal and Chartres streets in the French Quarter, and housed in historic buildings that date back a few centuries. Whether you’re after a $20 tchotchke, a vintage costume, or a $150,000 chandelier, you’ll find it in the French Quarter, within walking distance. 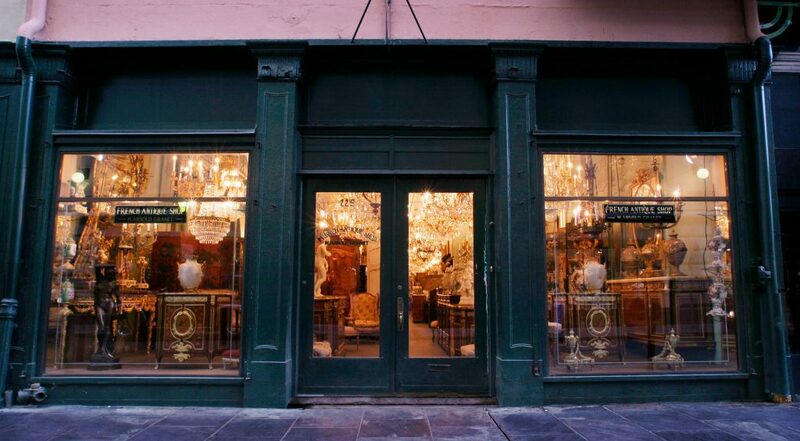 Below are our top 10 recommendations for the French Quarter’s antique and vintage stores, where you’ll find all kinds of treasures — from museum-quality continental furniture to art deco statues to Civil War-era weapons to the sequined hot pants of the 1940s. We’ve organized them by street and proximity to each other. This family-owned business was first started by Marie and Marcel Granet, who came to New Orleans in 1939, bringing their fine antiques from Paris. Now in its fourth generation of owners, French Antique Shop has been continuing the tradition in a 200-year-old building on Royal Street since 1947. The store’s 20,000 sq. ft. showroom is stocked with fine antiques imported from Europe, most dating back to the 18th and 19th centuries: furnishings, gilded mirrors, marble mantels, lighting fixtures, bronze statues, porcelain, and more. The store specializes in antique lighting. On any given day, sample merchandise could include 19th-century Parisian street lights or Austrian ballroom chandeliers. 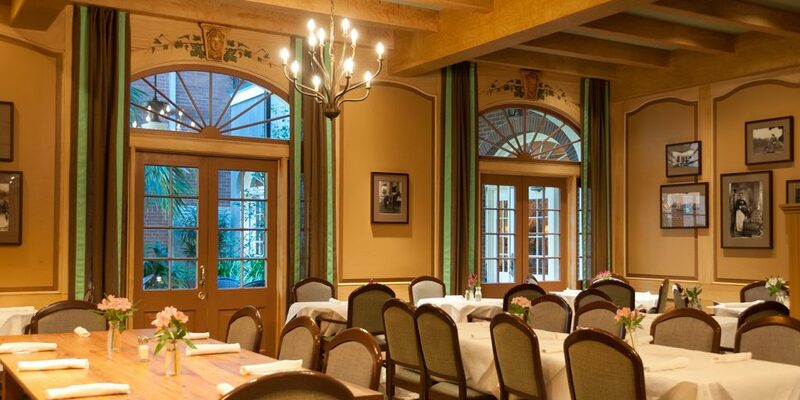 You’ll find everything from French country lanterns to a magnificent bronze d’ore chandelier with Baccarat crystal. A must-stop for film/TV memorabilia collectors, music lovers, and history buffs, the elegant and spacious Vintage 329 is generously stocked with an array of items autographed by celebrities. Merchandise includes signed first edition books, concert posters, photographs, music sheets, musical instruments, costume jewelry, and memorabilia — anything from a guitar signed by Mick Jagger to Marilyn Monroe’s iconic glam photographs. Rather small by comparison, this store is full of eclectic, charming collectibles and gifts, including antique walking sticks, antique medical instruments, European reproductions, and antique porcelain. The Brass Monkey specializes in French Limoges boxes, and carries Venetian glass. The family-owned James H. Cohen & Sons has been around since 1898, passing down through five generations. It has one of the biggest and most fascinating collections of rare coins and weaponry, in addition to the impressive stock of antique jewelry, antique maps, and other collectibles. You can spend an entire afternoon gawking at rare swords, Confederate coins, and Civil War-era muskets in the store’s 7,500 sq. ft. showroom. In a 200-year-old building, naturally. Trashy Diva was first started by owner/designer Candice Gwinn in 1996 as a vintage clothing store, but then evolved into a thriving clothing, shoe, and lingerie company sporting its own clothing line with multiple locations in New Orleans and Atlanta. More than 50 boutiques worldwide carry the line, and it boasts a strong online presence. The two French Quarter locations — one dedicated to lingerie and the other to clothing — are both on Royal Street, not far from each other. Although not strictly vintage, Trashy Diva’s boutiques deserve a mention because they carry well-made, flattering vintage-inspired pieces in styles from the 1920s through the 1950s (sizes range from 0 to 24), plus pinup-worthy accessories, at reasonable prices. The clothing boutique also carries covetable shoes. Transport yourself to the south of France by browsing this stunning showroom and courtyard featuring 17th- and 18th-century antiques, including pottery, limestone fountains, olive jars, and furniture. In addition to French antique armoires, mirrors, and chandeliers, Antiques de Provence carries vintage jewelry (Chanel is prominently featured) and French art, the works of French abstract painter Georges Ferrato in particular. Hands down one of the best antique stores in the country, the museum-like M.S. Rau Antiques has been in business since 1912 and remains a favorite among serious and novice antique collectors alike. The impressive 25,000 sq. ft. showroom and gallery houses rare antiques, including scintillating jewelry (some of it Mayan!) and 16th-21st century art and furnishings. You’ll find important pieces by Renoir and Brueghel alongside pieces by Faberge, Chanel, van Cleef & Arpels, and Tiffany & Co., next to the rare colored diamonds and sapphires of Kashmir. Bambi Deville’s Vintage Clothing is tucked away on the second floor of a sprawling building and well worth a visit if you’re looking for a 50s frock or some fun costume builders. The well-curated collection includes a remarkable amount of vintage leather garments and kimonos, plus sequined numbers, ball gowns, glam hats, and lingerie. The furs, delicate fascinators, 40s sundresses, and an occasional Victorian dress show-stopper are all equally well preserved and lovingly displayed. Formerly Greg’s Antiques, SecondLine Arts & Antiques has equally expansive indoor and outdoor spaces full of serious antiques and funky junkyard-type salvaged pieces like ironwork, signs and windows, plus a plethora of local art — all priced to move quickly. The space multitasks as a daily outdoor art and flea market. You can also rent a bike or book a tour while there, and even get a snowball. The outside space is particularly inviting with its bright signs, funky furniture, and party ambiance, and receives a lot of foot traffic. Le Garage is an inviting treasure trove, featuring racks packed tight with vintage costumes and costume starters, plus costume jewelry, tattered wigs and tutus, conversation-starter headpieces, military surplus, and things you didn’t know you needed but ended up incorporating into your Mardi Gras costume, never looking back. The space is… well, a garage, spilling out into Decatur Street; while rather tiny by French Quarter antique store standards, it is browsing-friendly and full of delightful surprises.